EpiXplore™ Meth-Seq DNA Enrichment Kit은 sheared genomic DNA로부터 메틸화된 DNA와 비메틸화된 DNA 절편을 분리하고 그로부터 Illumina® sequencing library를 제작 가능한 실험에 필요한 모든 구성품이 포함된 complete system이다. EpiXplore™ Meth-Seq DNA Enrichment Kit를 이용하면 Clontech 독자의 Capturem Nanoprep column 기술과 His-tagged MBD2 protein을 조합한 DNA Enrichment기술을 이용하여 메틸화 및 비메틸화 DNA 분리를 2시간 이내에 진행할 수 있다 (그림 1). 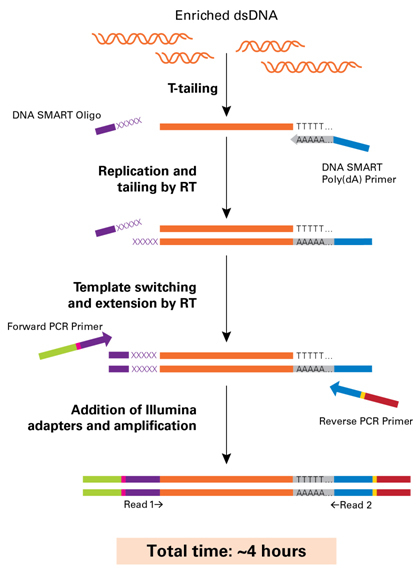 이후, DNA SMART® 기술을 이용하여 메틸화 DNA 절편 (또는, 비메틸화 DNA 절편)으로부터 Illumina® compatible sequencing library를 제작한다 (그림 2). NGS Library Prep은 ligation-independent DNA SMART® 방법으로 DNA 절편의 양 말단에 Illumina®-specific sequencing adaptor를 부가한다. 본 방법을 이용하면 low-input DNA 샘플로부터 4시간 내에 Sequencing library를 제작 할 수 있다. 그림 1. Flowchart for separating methylated and unmethylated fractions of DNA. 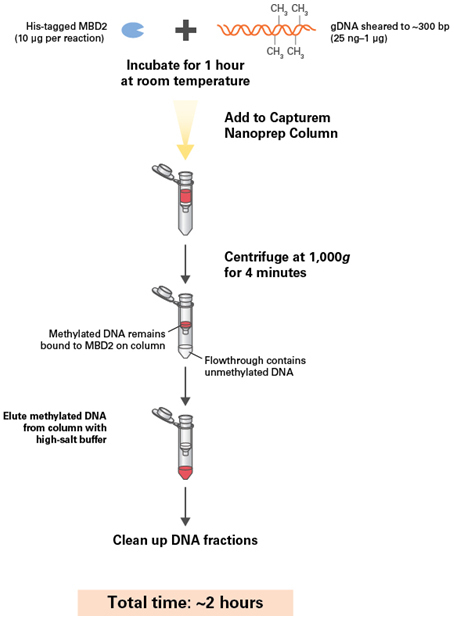 In the enrichment portion of the protocol, sheared DNA is incubated with his-tagged MBD2 protein for 1 hr, which allows the methylated DNA fraction to bind to the protein. The solution is then added to the Capturem nanoprep column, which binds the his-tagged protein and thus the methylated DNA. Subsequent washes with the Unmethylated Elution Buffer remove the unmethylated DNA. The methylated DNA is then eluted in a high-salt buffer. After cleanup, this enriched DNA can be used as the input for library preparation. 그림 2. Flowchart for DNA-SMART ChIP-Seq technology. This single-tube workflow allows users to generate Illumina-compatible libraries for meth-seq experiments. After library size selection and purification, the total time from input DNA to meth-seq library is approximately four hours. DNA SMART technology eliminates the need for an adapter ligation step and associated cleanup, reducing the loss of limited input DNA. 그림 3. Distinct methylation patterns are observed in aligned NGS data of libraries generated from methylated and unmethylated DNA fractions. A representative region of Arabidopsis chromosome 3 (outlined in the green box) shows the peaks identified in the DNA enriched for methylated and unmethylated fractions. The methylated regions are outlined in red boxes and the unmethylated regions are outlined in blue boxes. The amount of initial input DNA is shown along the left-hand side of the alignments. The data show good concordance with the publicly available bisulfite sequencing data. Data were visualized using the Integrative Genomics Viewer (Broad Institute). Public data was obtained from GEO accession GSM980986; Stroud et al., 2013. 메틸화 DNA 서열 분석을 위한 NGS Prep kit (Epigen..